"Is man ready to re-constitute it?" What the heck is this? A full trailer has debuted for a film titled The Broken Key, some sort of weird sci-fi mashup involving historical artifacts and modern technology and all kinds of wacky things. It's set in the near future, at a time when paper has become a rare item, "a luxury possession", and printing is now a crime. The main character is a British scholar of ancient Italian origins, who gets caught up in a series of murders taking him "on the path traced, so many centuries before, by Dante Alighieri and by the painter Hieronymus Bosch." This stars Rutger Hauer, Michael Madsen, Christopher Lambert, Geraldine Chaplin, Franco Nero, William Baldwin, Maria de Medeiros, Kabir Bedi, and Marc Fiorini. This really looks way too weird for my tastes, another film straight from the 90s destined to find its way into VHS bargain bins. How these films are still getting made is beyond me. In a near future, due to the effects of an uncompromising law on the eco-sustainability of supports, paper has become a rare item, a luxury possession, controlled by the "Big Z": Zimurgh Corporation. 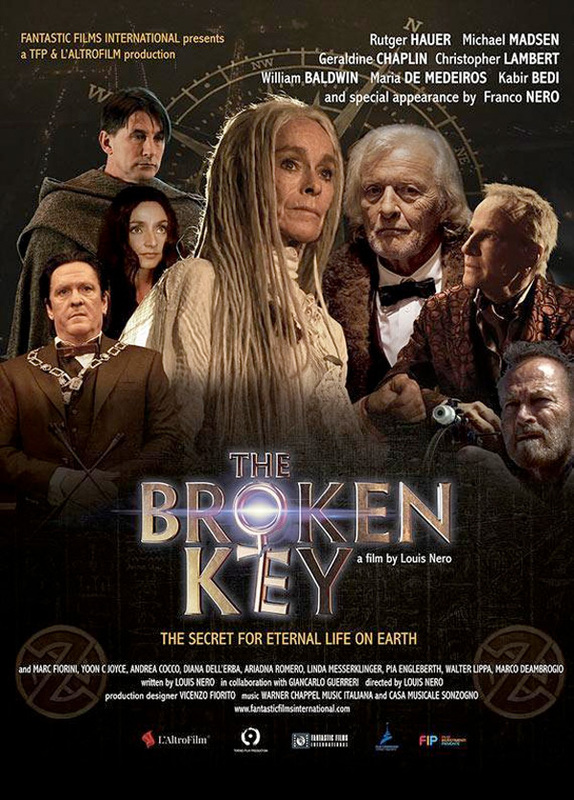 The Broken Key is directed by Italian filmmaker Louis Nero, of the films Il mistero di Dante, Rasputin, La rabbia, Hans, and Golem previously. The screenplay is written by Louis Nero in collaboration with Giancarlo Guerreri and As Chianese. The film is set to open in theaters in Italy in November, and hasn't played at any film festivals. The Broken Key still has no official US release set, stay tuned for more. Is anyone interested?